AutoSqueeze - A Tasker/Locale Plugin for all your Squeezebox music streaming needs! Some people have been asking about the new feature that is "Custom command". This is simply put just a way for more advanced users to send any command they would like. Autosqueeze automatically puts the chosen player's mac address at the start of the command (aka the <playerid>) so all you have to do is put in the actual command, e.g. [display Hi there] without the brackets. For a list of possible commands you can check: your Logitech media server > Help > Technical Information > Command Line Interface. But what might be even more interesting is that this also supports Tasker variables, for even more tweakability. That's it for now! Ever wanted to control your Squeezebox devices without reaching for a remote? Or wanted the music to automatically turn on as soon as you enter your home? Well now you can! With AutoSqueeze! I love Android and Automating stuff. If you're anything like me in that concern you've probably heard of, or used either Tasker or Locale on your Android phone or tablet. Well so have I, but I also love Music! That's why around my house I've got a couple of Squeezeboxes, these are audio streamers which connect to a computer running Logitech Media Server. And from there on out are able to stream your complete music collection and all possible radio stations! And what's even more awesome, is that all these streamers are controllable via the web, and thus also your smartphone! This is when I started thinking, how awesome would it be if my music system would automatically turn on and start playing the moment I entered my house. This is where AutoSqueeze comes in, it is a plug-in for Tasker/Locale that allows you to send a command (like "play") to one of your Squeezeboxes! 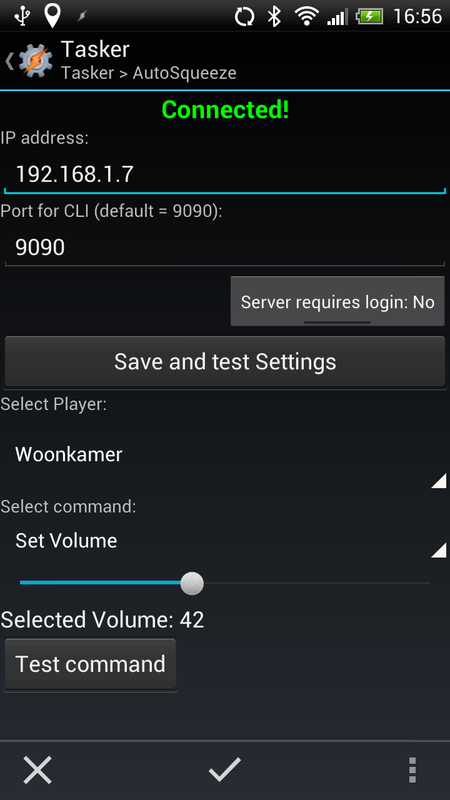 All you have to do is open Tasker/Locale, set your situation (for example: time between 10:00-20:00 and connected to WIFI), and configure the plugin (eg. Start playing in LivingRoom). That's it! Next time I enter my house between 10am and 8pm and my phone connects to my WIFI network the music in my living room automatically starts playing! This is just the most basic example I can think of for using my plugin, but since it uses Tasker/Locale to be set up it is completely up to you on how you're gonna use it! Have fun experimenting! If there is another command you would like to see implemented, just leave a comment! I'm not a professional programmer by any means but I will definitively give it a shot! That's it for now, in future posts I will probably talk about some more use-cases and describe how to use Tasker's scenes to create a widget tailored to your SqueezeBox!